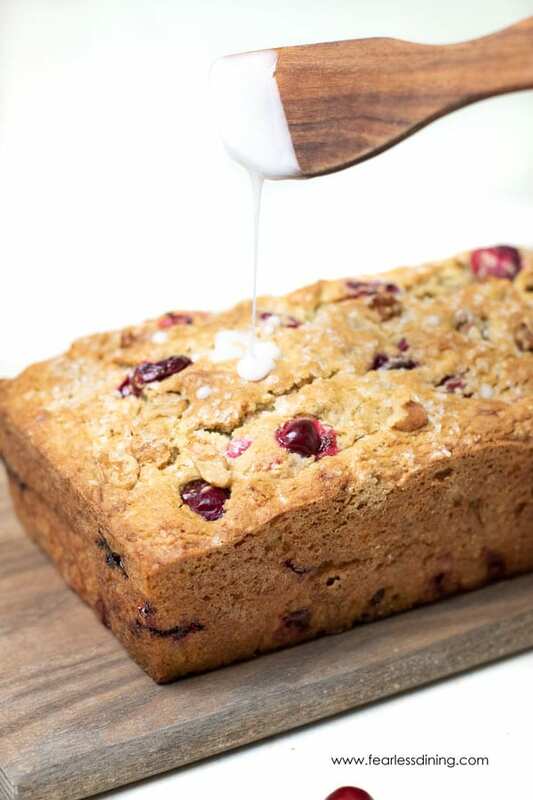 Get ready for a deliciously super moist banana bread with cranberries. 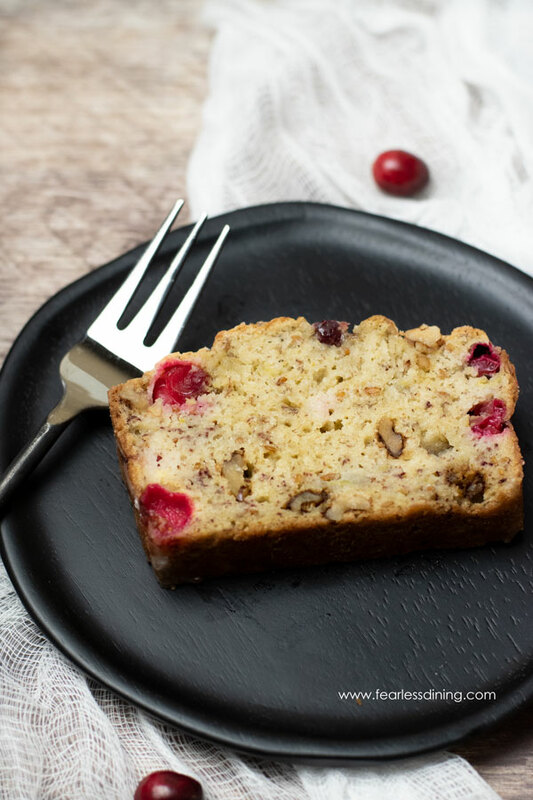 This gluten free cranberry nut bread is perfect for fall. 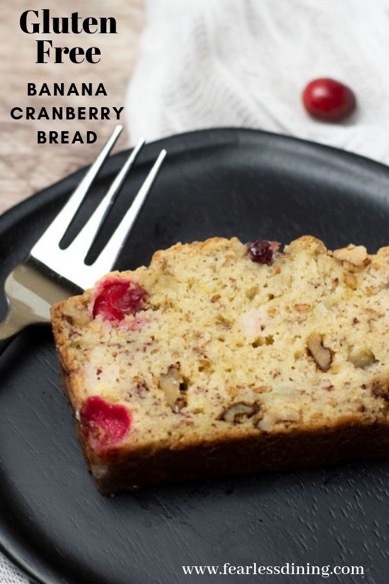 Loaded with sweet bananas and fresh cranberries, this gluten free cranberry banana bread will quickly become your family’s favorite breakfast bread. Fall is in full swing and I finally found fresh cranberries at the market. I LOVE the tartness of fresh cranberries. 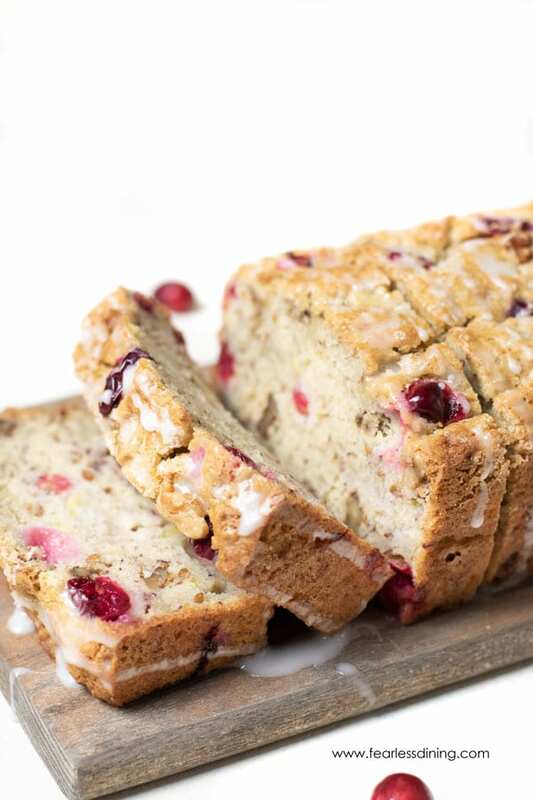 It adds all sorts of flavor to gluten free baked goods like these Gluten Free Cranberry Muffins and these Gluten Free Cranberry Shortbread Bars. 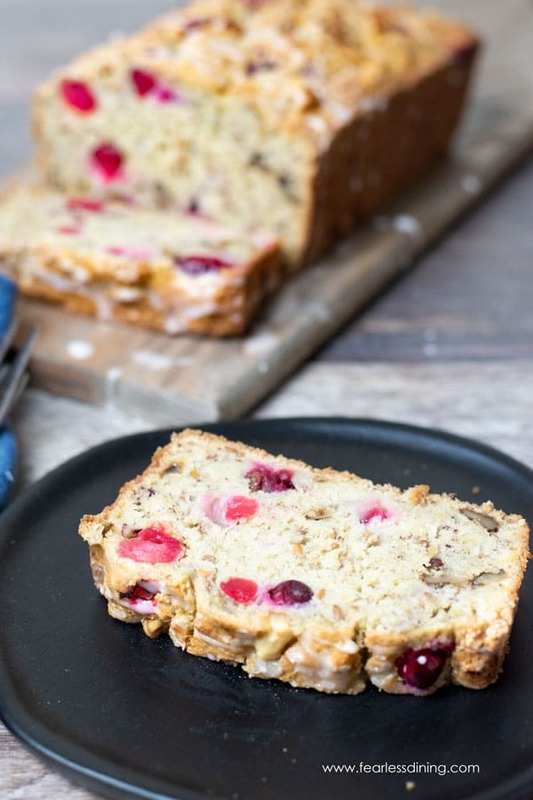 This cranberry banana nut bread is not only gluten free, but it is dairy free too! 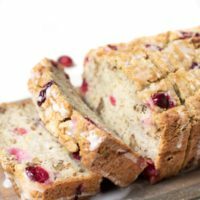 It makes a wonderful addition to your Thanksgiving morning breakfast, or serve this gluten free cranberry banana bread anytime! 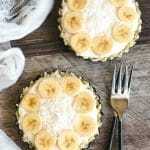 Place your bananas (with the peels on!) on a baking sheet and bake at 225 for 20 minutes. 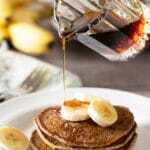 The low-temperature heat will also help to caramelize the bananas adding to their sweet flavor. The first step it to add the dry ingredients to a bowl and whisk to blend. Do the same in a smaller bowl for the wet ingredients. 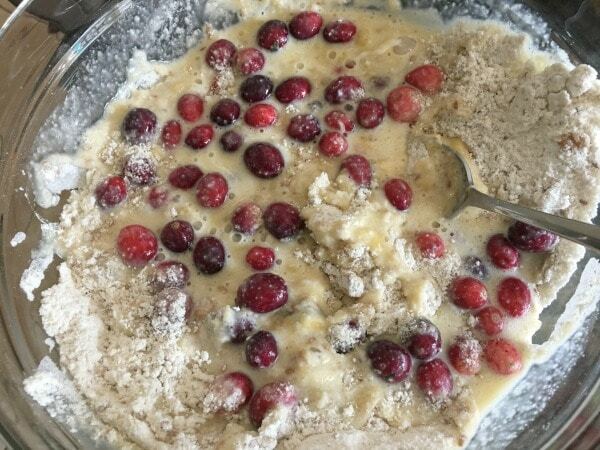 Pour the wet ingredients into the dry ingredients and add fresh cranberries. Mix gently. Your batter will look like this when it is mixed. Pour the batter into a greased bread loaf tin. Bake at 350F degrees for 30-35 minutes. 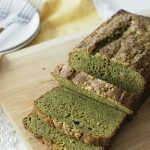 How do you know when the banana bread is done baking? To check to see if the gluten free banana cranberry bread is done baking, insert a toothpick in the middle of the bread. If the toothpick comes out smoothly, it is done. 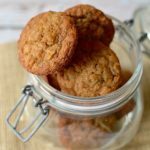 If there is any batter or crumbs on the toothpick, bake an additional 10 minutes. Can you use dried cranberries if you don’t have fresh cranberries? You can definitely use dried cranberries, but they may not give the same tart juiciness of fresh cranberries. 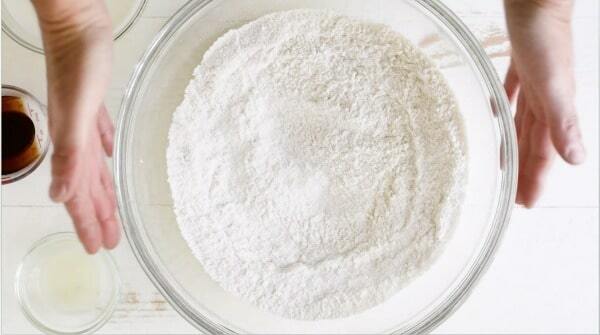 I used this gluten free flour blend, others should work…make sure they contain Xanthan Gum. If your blend doesn’t, add 1 teaspoon. Bread loaf pans help shape your bread. In a medium-sized bowl, add the wet ingredients and mix. Pour the wet ingredients into the dry ingredients. 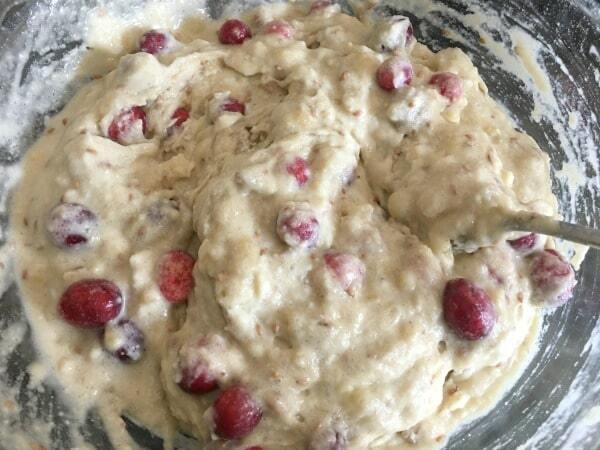 Add the fresh cranberries and walnuts. 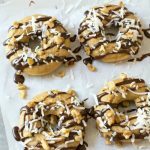 Mix together and pour the batter into a greased bread loaf tin. This came out very nice, but it took and hour and 20 minutes to bake. I’m not sure where the 30 minute baking time came from. 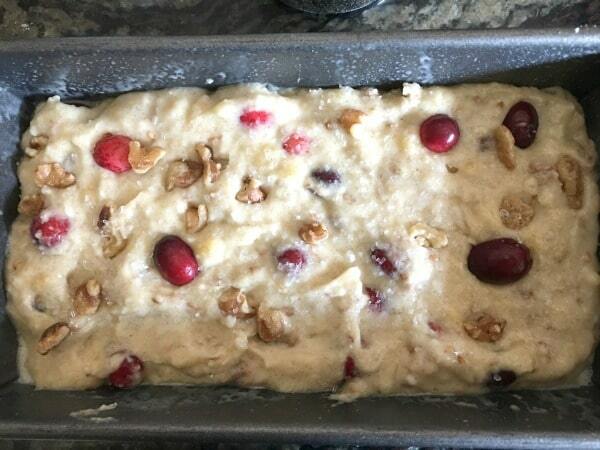 I’m all about cranberries this time of year, this bread was perfect! I wish cranberries were a thing all year round. I love their juicy tartness!